Hello, Readers Mine! Well it's been a hell of a week at Solomon Mao's (or at least in the pocket of space-time where the author of Solomon Mao's lives). I wrapped up graduate school completely last Wednesday, making me a Master of the Arts (History) at long last, and spent the weekend just past celebrating my wedding anniversary, saying some good-byes, and moving everything from the apartment back home. That's right, after four years of marriage and one co-authored book, Dale and I will actually be living together on a full-time basis at last! Who knows? This might result in more books! But you don't come here for updates on my personal life, so onward to our shared obsessions: Breaking Bad and Wanna Cook! So Vince Gilligan had an interesting encounter down under at the Sydney Writers' festival this weekend, where he got to meet some of the people who helped make Australia the number one nation for illegal downloading of Breaking Bad episodes in the world. Gilligan apparently proved that Southern-by-way-of-LA charm is just as effective on Southerners-by-way-of-the-Tropic-of-Capricorn as it is on any other group of folks, and responded with his trademark mix of modesty and gratitude. (It's also worth noting that Gilligan made a nice pile from Breaking Bad - and deservedly so - so he can literally afford to be gracious!) Check out the full story in The Guardian. In Wanna Cook? 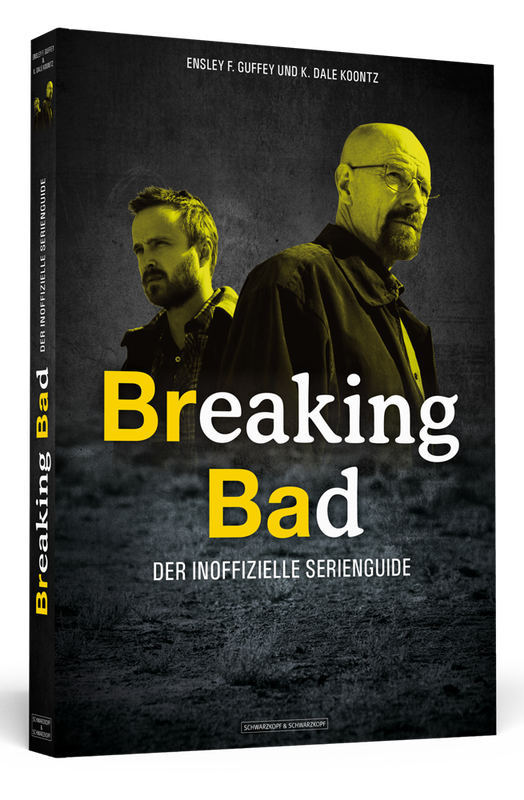 news, I got a peek at the German cover of our book! Working with ECW, the German publisher Schwarzkopf & Schwarzkopf was translating Wanna Cook? as we were writing it, and the result will be available to the public on 1 June 2014 (according to Amazon.de). So, pretty cool in-and-of itself, right? Wanna Cook? in German, by Guffey und Koontz!!!! That. Is. AWESOME!!!!!!! We get a couple of author's copies, and I can't wait to see em! What do you guys think? For those of you who read German, you can pre-order your copy today (but watch out for shipping and VAT!) For those of you who, like me, can basically only manage ja, nein, bitte, and volksgemeinschaft however, you can get your copy in English right now! And for those of you who not only speak and read English, but live in the Splendid Islands themselves, you can get a copy from Amazon.co.uk! So go, buy our book, enjoy it, and let us know what you think by writing review or two! So that's it for this week, Readers Mine. Until next time - Keep Cookin'!